As I reported earlier, May 3rd. 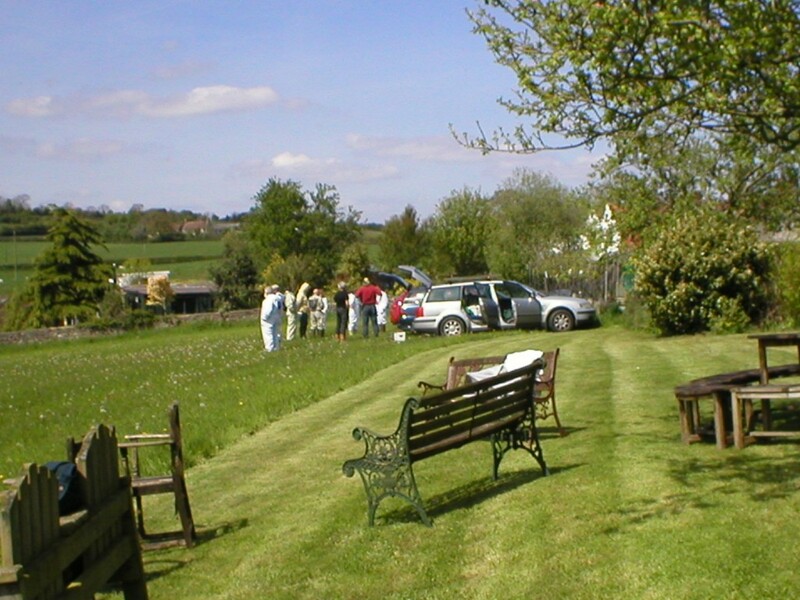 was to see the first of this year’s Apiary meetings. 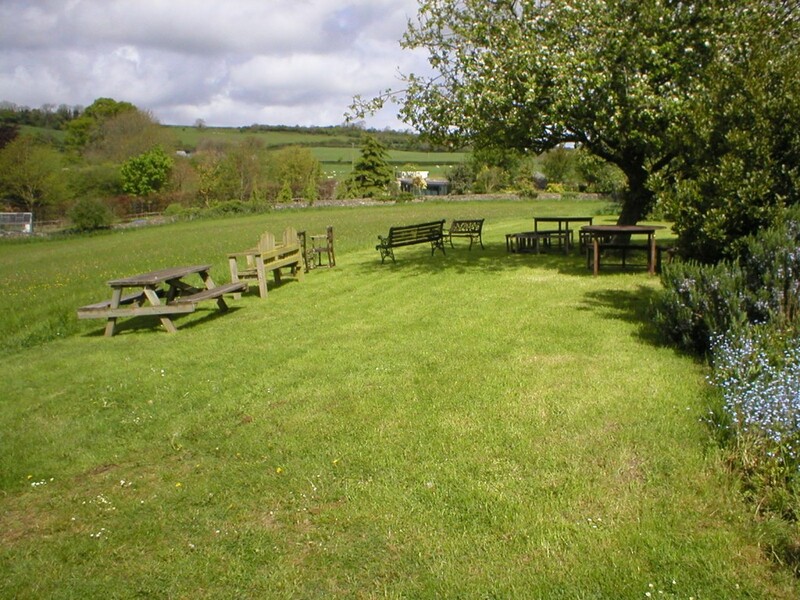 As usual, most of Friday had been spent mowing the lawns at the top of the meadow and re-arranging the garden furniture. I had managed a quick look at the bees and all seemed well there. Friday had been a lovely day and the forcast for Saturday was good. It was with a sense of eager anticipation I stood surveying my handiwork before setting off in the direction of home. It was now, early evening and the meadow was a picture. Although I ached in every muscle, it was well worth it to see the meadow at it’s pristine best. Just the direction signs to install, which doesn’t take a minute, then home. Fortunately, I had managed to work up a bit of a thirst which if I was able to come up with an acceptable solution, I promised myself I’d sort out on the way home, so it wasn’t all bad news. I’m sure the second cluster was deeper in the bush and I know for a fact that the thorns were sharper, I still had half of them attached to my hands and fingers. I just hope the little blighters appreciate all my efforts but if they do, it’ll be a first! Fortunately,I arrived back at the meadow just ahead of my first guests. Hand shakes and introductions over, we made our way down across the meadow to the bees. David Maslen was once again in fine form and as always, failed to disappoint. Lively discussion, as usual, accompanied his manipulations and I was pleased to see the new faces joining in quite wholeheartedly. I always enjoy these open days, They’re an oportunity to renew old aquaintances and make a few new ones. We always have a spot of tea together afterwards, usually accompanied by more than a little light hearted banter, for me, one of the best bits. I never fail to come away without having learned something new or if not, at least having something new to think about. This was, if you recall, the colony on extended brood and because of this, them having all that extra brood space and a super,I suppose I never expected them to be considering swarming. I know they were originally a swarm that I had collected but previous inspections had revealed no signs, not even a play cup. So, when I had inspected them earlier in the week, seeing brood from frame three onwards, and no noticable change in their behavour, I had boxed them up and moved on. Had I looked at frames four and five I would have noticed that they were preparing to swarm but, once again, I had misread the signs and paid the price. Five o’clock and once again I had the meadow to myself, dirty cups and plates back in the boot of the car along with the leftover sandwiches. Not much left, a good sight I always think, and I won’t have to worry about supper I thought. So, just the swarm to sort out and then home. Approaching the two nuc.boxes it was immediately obvious that there hadn’t been two swarms as all the bees were all in the first nuc. What had obviously happened was that the queen had paused when entering the bramble bush just long enough to deposit some of her pheramones before moving further into the bush. This was the reason why the bees were clustering in two places. Had I been a little later in approaching the bush, I’m sure that I would have found them all clustered around the queen as the scent of the pheramones in the first spot had worn off. I should have guessed this at the time but the shock of seeing the swarm on that Saturday of all days had blurred my vision, I have to say that at that moment all I could think of was all my guests arriving to find the apiary enveloped in swarming bees with me somewhere in the middle of them. 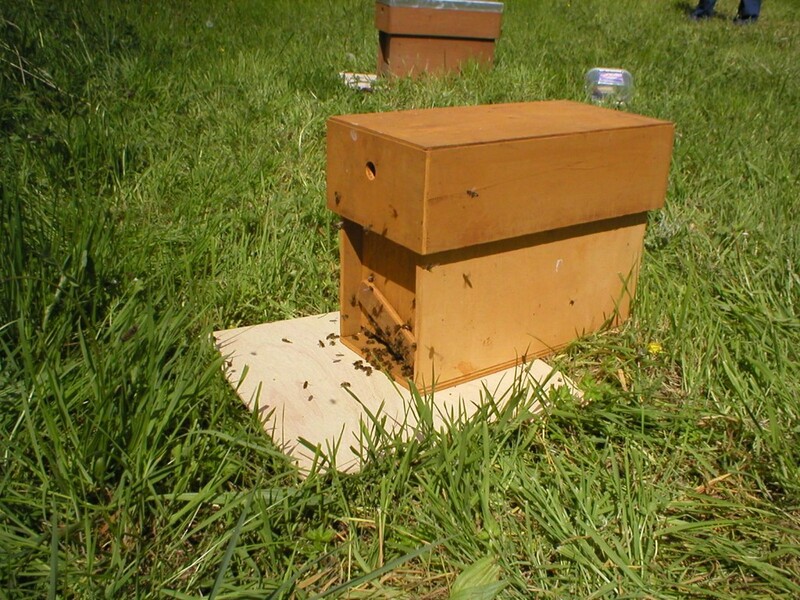 I decided to put the swarm into one of the mating nuc’s.while I decided what best to do with them long term. Whilst not wishing to keep the queen, I didn’t want to lose the bees so into the nuc. they all went. A frame feeder full of syrup, a frame of drawn comb and three frames of foundation should keep them busy for a while I thought as I made my way back up the meadow to the car. Quite an eventful day I seem to remember thinking as I drove home, not gone exactly as planned but certainly one to remember. I had earmarked colony eight to supply my queens this year some time ago. They had over wintered very well and exhibited all the qualities that one would want in a colony. They were on double brood and had an abundance of stores and brood in both boxes. Time to Demaree I decided, no need for grafting or Miller frames as eight was to supply both larvae and nurse bees. Opening the hive and seperating the two brood boxes I re-arranged the brood so that the bulk of the sealed brood was in the bottom box along with the queen and the eggs and unsealed brood in the top box. The hive is then reconfigured thus, queen excluder on the bottom box followed by two supers and then the top box. The beauty of this method is that there is a minimum of disruption to the colony, the bees will continue to work the honey supers if there are any and, following the procedure, it is only a matter of removing the two supers and repositioning the queen excluder to revert the colony back to normal. 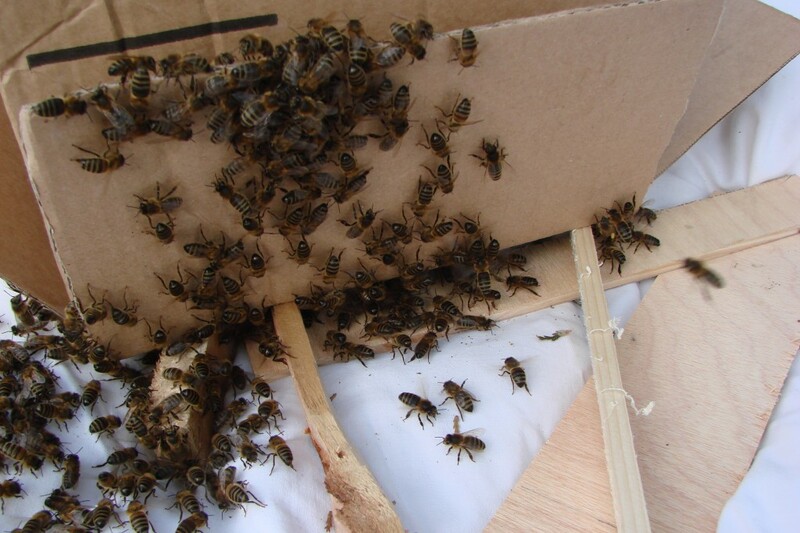 The nurse bees quickly make their way up to the unsealed brood in the top box and sensing that they are queenless, there being an absense of queen pheramones brought about by the seperation of the two boxes, start to draw out queen cells. Anyway, that is the thinking behind the Demaree method. Provided you have a colony on double brood, this is a simple and reliable method of queen rearing. I have to say however, last year I Demaree’d two colonies on two seperate occasions and neither produced a single queen cell so no method is absolutely foolproof, but then, last year was a strange year wasn’t it. So that was how the meadow looked when I left it Sunday afternoon, all the bees seemingly unaffected by yesterday’s intrusions, happily doing what bees do best. The comings and goings at the entrance of the nuc. housing yesterday’s swarm suggested they were happy with their new abode. A pretty good weekend’s work I told myself as I drove home but, as I was to find out, it wasn’t over yet. It was somewhere arround six thirty and I was thinking about what to have for dinner when the ‘phone rang. “Is that you Geoff” a voice enquired, “I think I’ve got a swarm of your bees in the conifers outside the back door”. It was Dawn, a very nice young lady who lives in one of the cottages bordering the meadow. “Are you sure” I replied thinking to myself, surely not two swarms in two days. We had examined all the colonies the day before and we hadn’t seen any queen cells. “Well, they look like your bees” came the reply. I’ll see you in about twenty minutes I replied. Driving over I couldn’t help thinking that this was all a bit like waiting for the proverbial bus, you know, wait for ages then two or three all come along at once. If it was another swarm, what was I going to do with them, I had no spare hives and I didn’t want to tie up any more mating nuc’s. Probably not bees anyway I was telling myself as I pulled onto the driveway but once again I was to be proved wrong. 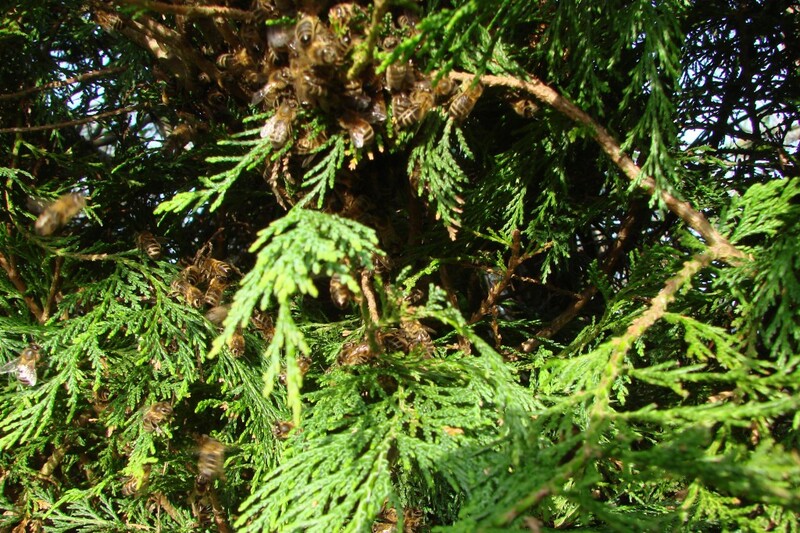 From where I had stopped the car I could see clouds of bees amassing around the conifers. I decided the best thing to do was to get them out of the conifer as soon as possible. Although I had done my best to assure Dawn that swarming bees seldom, if ever sting, I could see by the look on her face that she wasn’t entirely convinced. “If they never sting, why are you the only one of us wearing a beesuit then ?” came the question. Best leave that one un-answered I decided. 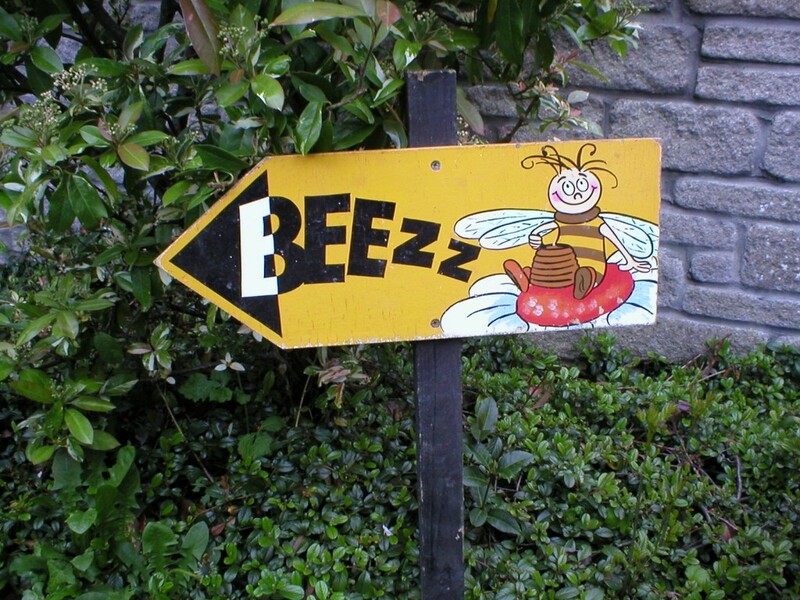 I appreciate that it can be quite alarming to suddenly be confronted with thousands of bees milling around outside your back door, so best get them sorted out as quickly as possible. The only thing I had to hand which was at all suitable was a small cardboard box so it was into that that they were shaken. 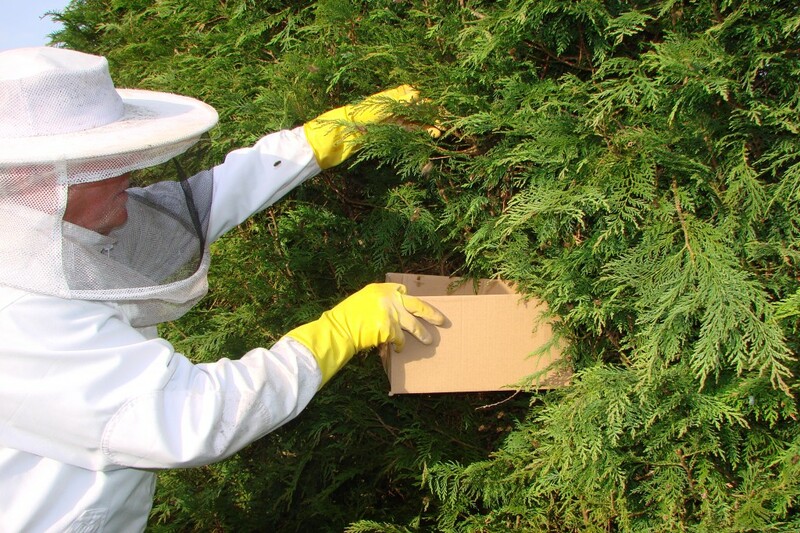 With most of the bees inside the box, the whole lot was placed upside down on a sheet on the grass close to the conifer. One side was propped open and fanning at the entrance soon told me that I had a queen in residence. I planned to leave them like that until the morning when I would decide exactly what to do with them. By now the flying bees were starting to gather at the entrance of the box, further evidence that the queen was at home but, more importantly, Dawn’s mind was at rest regarding the potential menace outside her front door. But, the question remained, where had they come from ? It was only yesterday that we had examined all the colonies as part of our open day manipulations and there were certainly no signs of imminent swarming then. Had the swarm that I’d hived last night swarmed again. I decided to take a walk down the meadow before leaving to find out. The lack of activity at the hive entrance followed by a quick look under the crown board confirmed that this was exactly what had happened. They had swarmed again, but why ? Monday’s visit to the meadow began with a ‘phone call to my friend Liz, my usual course of action when I’m confronted by a beekeeping problem that I’ve not encountered before. I explained the situation, yes, they’ve got a frame of stores, yes, drawn comb, I’ve put them in mating nuc.1. These were my answers to Liz’s initial questions. “The only thing I can think of” said Liz, “being a prime swarm, I wonder if they’ve got enough room in a nuc. I’d be inclined to try them in a full size brood box”. That makes sense I thought, wonder why I didn’t think of it ?. After thanking Liz, I set about collecting the box with the bees. It was just a case of closing the entrance before picking up the corners of the sheet. Two minutes saw me complete with bees at the apiary. 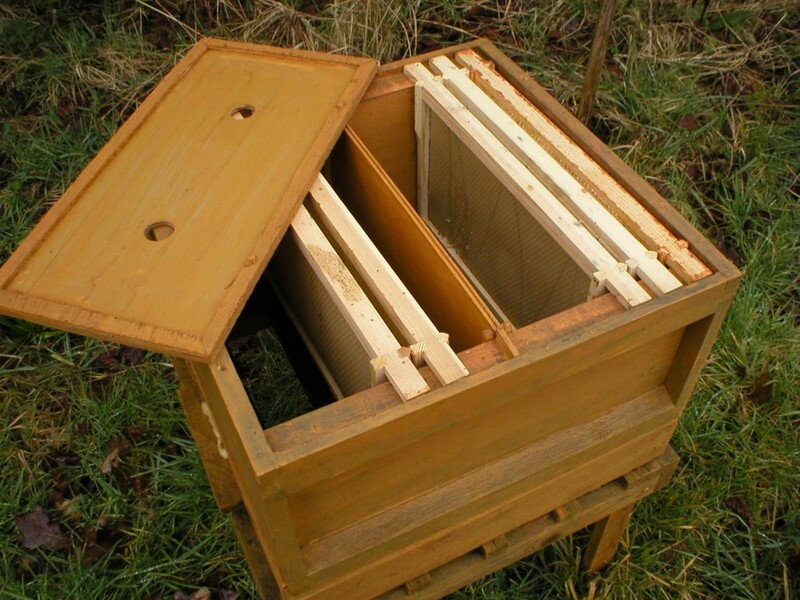 My mating nuc.s are simply modified brood boxes.They have a sliding central partition which divides the box into two five frame nuc.s and have a second entrance so that the two halves can operate entirely independantly of one another. So, just a matter of removing the partition, adding some frames of foundation, closing off the other entrance and adding the bees. I waited long enough to see bees fanning at the entrance with their sisters coming and going before making my way back up the meadow. A strange one that, I couldn’t help thinking as I made my way back up the meadow, it’ll be interesting to see whether the increased space does the trick. Nothing more to do than keep a watchful eye on them. A week had gone by since I’d Demaree’d eight, time to take a look I decided and what a lovely sight greeted me as I opened the top box. Seven plump queen cells spread over three frames, this was the chance I’d been waiting for, the oportunity to get my queen rearing 2014, off the ground. I had rearing nuc.’s three and four vacant along with my “stand alone” nuc. so, the next step, reduce the queen cells to one per frame keeping the best looking one. These I then placed along with one other frame of brood/stores into the nuc’.s doing my best not to dislodge the attached nurse bees. A further frame of bees was shaken into the nuc., a frame feeder and two frames of comb made up the numbers before the nuc.’s were closed up. Later that evening they all had a feed of thick syrup, just sliding the crown boards gently to one side allows me a quick look into the box’s whilst pouring in the syrup, all with a minimum of disruption. Pleased to see, they all looked to be settling in nicely. It became clear over the next few days that the swarm in nuc.one/two were becoming somewhat irritable, it was noticable that the pitch coming from within the hive seemed to rise as I approached and also, they were paying me a little more attention than I liked when I got anywhere near them. This to me is a classic symptom of queenlessness so time to take a look I decided. Twice I went through the frames, much to the annoyance of the hive’s inhabitants, plenty of bees, plenty of stores, but no eggs or brood, in short, no signs of a queen. I decided to leave them for a couple of days and then have another look, just in case I’d missed her, but no, an inspection two days later confirmed her absence. Further proof, if proof were needed, was provided by a neighbour who had seen a small swarm on a gatepost some days earlier. Jolly good riddance to her, or something along those lines, I couldn’t help thinking, ungrateful little B. So, the next step, I didn’t want to lose the bees but did want to get nuc.s one and two back to the purpose for which they were intended. I decided to first split them up by re-inserting the partition then give each side a frame of young brood to enable them to each draw out their own queen. But, which colony to provide the brood, I didn’t want to take any more from eight as that would have meant totally sacrificing the colony and I really wanted to save what was left of them. Two was my next best colony and were already busy filling their third super so it was two that I decided on. The reason that I hadn’t considered two earlier was that it was, if you remember, two which swarmed last year and swarminess is one of the things I’m trying to breed out. I had mentioned this to David Maslen during last week’s apiary meeting when he had remarked on how well two was progressing. He pointed out that in his opinion, if two were of a swarmy disposition and considering swarming, they would be certainly be exhibiting signs by now and there were none, from memory, not even a play cup. That made sense I thought, so two it was to be. I was still thinking of David’s comments when I made my way, smoker in hand, down the meadow later that afternoon. 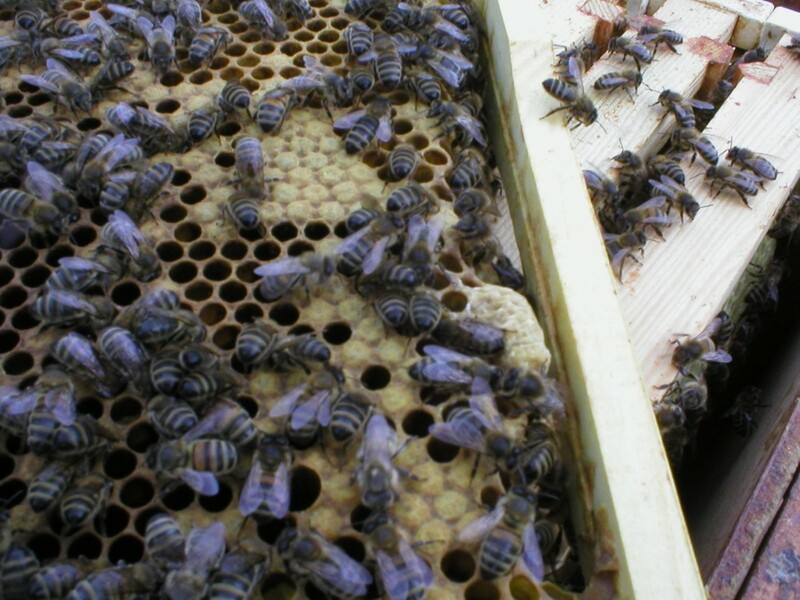 Bearing in mind that it was barely a week since we had thoroughly examined two and at that point, hadn’t found even a play cup, you will have some idea of my astonishment upon opening the hive, at finding somewhere in the region of a dozen queen cells. These were spread evenly throughout the brood chambers and about two thirds were sealed. I knew that they hadn’t swarmed as they weren’t queenless and the sheer volume of bees also seemed to confirm the fact. So, what was the purpose of it all. At this moment I’m still pondering that question but they had, by their actions, made the job of queening nuc.’s one and two easier. So, breaking down all but two cells, one on each of two frames of brood, I transfered these into the two nuc.’s, complete with bees. Later that evening all the nuc.’s were given a feeder of thick syrup. I have kept a close eye on them all since then and have been pleased to see the activity at the nuc. entrances has increased daily with a fair quantity of pollen being taken in, always a good sign I think. Last night I topped up all the feeders, the bees took little or no notice of me, their demeanor sugesting all was well. I do hope so as I’m not going to around for a few days next week and I don’t want to come back to any unpleasant surprises. So, there we are, the nuc.’s have been fed, most of the hives have been given an additional super and I’ve organised the extractor for the following week. I shall have a look at two later today and that will be that for a couple of days. Speak to you later. This entry was posted in Uncategorized by geoffadmin. Bookmark the permalink.